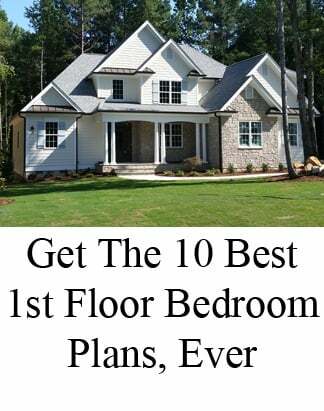 Below are the top 5 underrated tile design locations - with custom home builder tips on how to integrate tile walls, splashes, ceilings, and surrounds. 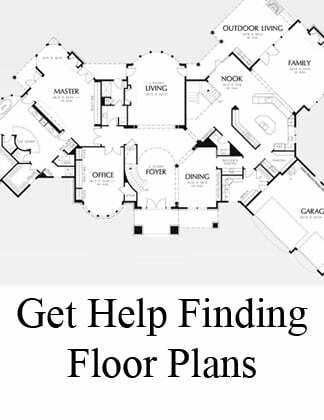 Get ideas for your next home - with photos of bathrooms, laundry rooms, and other custom spaces. 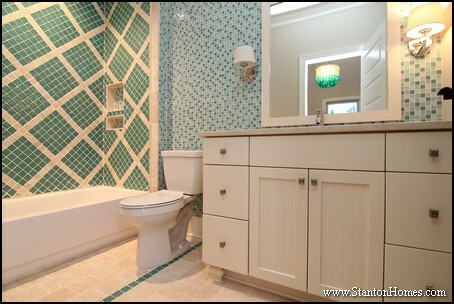 Guest and kids bathrooms are a great place to add a splash of color with touches of tile. Because these spaces are generally much smaller than the master suite bathroom, integrating tile will not break the bank. In this Raleigh custom home, the kid's bathroom features a full wall of tile in soft creams, blues, and turquoises. Pros: Tile walls are durable and easy to clean. Tile designs and colors are limitless, so you can create a truly personal space. Cons: While tile will resist the wear and tear of use over time, you cannot "repaint" to change the color scheme of your bathroom. 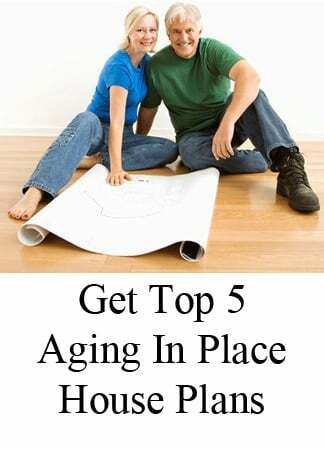 If your family plans to grow with your home, you may opt for more subtle tile additions, or less square feet of tile, so you have the option to repaint the surrounding walls to suite lifestyle changes. In this bathroom, a mini mosaic tile pattern frames the bathroom mirror. This is a Jack and Jill / Buddy Bath design: multiple entrances allow access from two separate bedrooms (to the toilet and tub room) and a hallway (to the vanity room). Get more ideas for kids' bathrooms, here. While tile kitchen counter tops haven't made a come back yet, you may be seeing more bathrooms and powder rooms with tile under the sink. In this Raleigh custom home, a gold vessel sink rests on a metallic mini mosaic tile design. 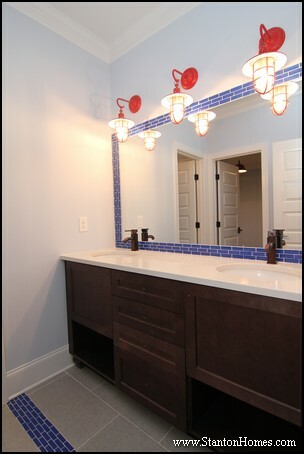 Blue bathroom walls - like this powder room - continue to be a popular paint color choice in Raleigh custom homes. See 10 powder room layouts for small spaces, here. 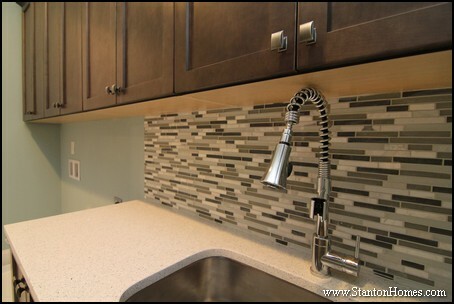 Back splashes make a great addition behind any sink - whether in the kitchen, bathroom, or laundry room. A laundry room tile back splash will protect your walls against water and dirt, and make it easier to keep your space clean. A linear mini-tile pattern spans behind this large single bowl laundry room sink. 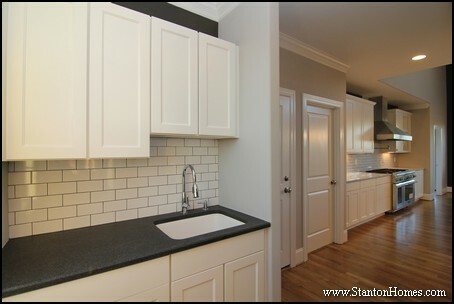 White brick tile - carried into the laundry room space from the kitchen - spans behind the black granite counter top and white sink. 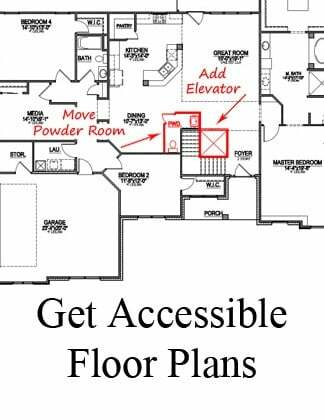 See home plans with the laundry room next to the master suite, here. Popular fireplace surround materials can include: brick, concrete, metal, stone, wood, and tile. 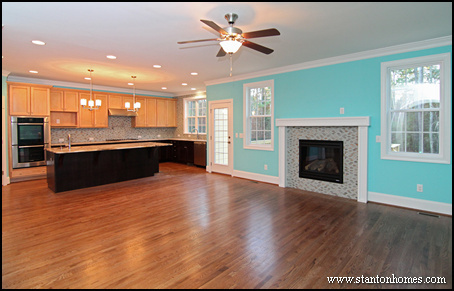 In this Raleigh custom home, the fireplace surround is built in the same mini tile as the kitchen backsplash (which extends up the entire sink wall). Alcove tubs - especially those with a barrel vault ceiling - create a relaxing bath experience. Top it off with an elegant white tile pattern, and you'll have the perfect place to unwind. 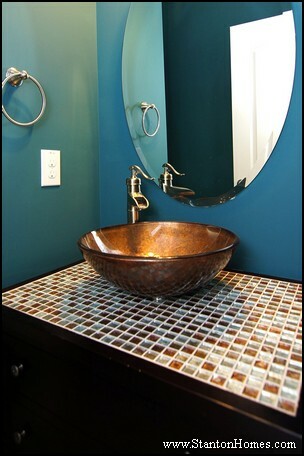 Mixing mini tile mosaics with over-sized brick tiles can make small (and large) bathroom spaces feel even bigger. Often, it can be more appealing to use a mini mosaic on the floor (rather than walls) for a textured floor and smooth walls.